“Stylish Passionate Folk Rock” – R2, “Outstanding and Evocative” – FATEA, FolkLaw’s music will get your feet tapping and your mind thinking. Inspired by 10 years on the road in Europe and North America, FolkLaw’s songs are a commentary on life, with earthy lyrics and vocals accompanied by Celtic fiddle and distinctive vocal harmonies. Described as “Show of Hands with a new wave ethic” (fRoots) and winning friends and fans wherever they go, FolkLaw are a unique blend of energised entertaining UK folk-rock. Featuring Nick Gibbs on fiddle a former Keynsham resident, FolkLaw are ….. “Stylish Passionate Folk Rock” – R2, “Outstanding and Evocative” – FATEA, “Whirling Jigs and Lyrics which bite!” – fRoots. FolkLaw’s music will get your feet tapping and your mind thinking. Inspired by 10 years on the road in Europe and North America, FolkLaw’s songs are a real commentary on life, with earthy lyrics and vocals accompanied by Celtic fiddle and distinctive vocal harmonies. 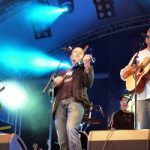 Described as “Show of Hands with a new wave ethic” (fRoots) and an “acoustic New Model Army” (FolkWorld), FolkLaw have forged a unique blend of energised entertaining UK folk-rock. Brand New album “Smokey Joe” is OUT NOW!!! Described as “Outstanding and Evocative” by FATEA, “Stylish Passionate Folk Rock” by R2, and “a milestone of folk music” by FolkWords “Smokey Joe” is FolkLaw’s latest album. Mixed by Lyndon Webb, mastered by Daz Smith, and released on Fiddle of 8 Records, it’s been launched to critical acclaim, been played on radio from the BBC to Canada, Germany and Australia, and includes tracks which have appeared on the front cover of R2 magazine and reached the semi-finals of the UK songwriting contest.